Watching all the movies on the Warner Bros. 50-movie box set that I bought for cheap. This week the random number generator selected The Hangover. That’s right, Warner decided that freakin’ The Hangover belonged on the same list of movies like Gone With the Wind, Amadeus, and A Streetcar Named Desire. Here’s what happens: On the night before Doug is married, he goes to Vegas for a bachelor party with alpha male Phil, stressed-out nebbish Stu, and the socially befuddled Alan. After a night of partying, Phil, Stu and Alan wake up hungover in a trashed hotel room, with no memory of the night before, and no idea where Doug is. They attempt to retrace their steps, experiencing a variety of misadventures while trying to find Doug and get him home in time for the wedding. 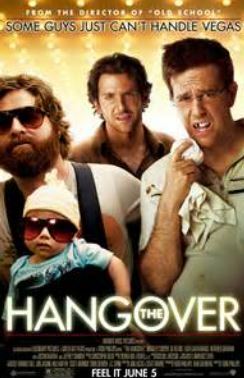 Why it’s famous: The biggest in a wave of “bad behavior” comedies of the 2000s, The Hangover made celebrities of Bradley Cooper, Ed Helms, Zach Galifinakis, and Ken Jeong. Get your film degree: For as substance-less as this movie is, the three main characters fit into a classic comedy archetype: The nice guy, the angry guy, and the dumb guy. Variations on this formula can be seen in lots of iconic trios — Mickey, Donald, and Goofy; Bugs, Daffy, and Porky; Jerry, George and Kramer; Fone Bone, Phony Bone, and Smiley Bone; and so on. Movie geekishness: I put the commentary on, and director makes a big deal over having carefully worked out exactly what the guys did during their wild night, so that all the clues and all their experiences can be pieces together, if fans are interested. Thoughts upon this viewing: I don’t know. I think The Hangover only works when you see it the first time, not knowing what’s coming next. The humor relies on surprise, and catching the audience off guard. Yes, it’s funny, but it doesn’t hold up to repeat viewings. Next: The lunatic is on the grass.